Tools aloft. – Dirty wet dog , boats and sailing. Its really not a good idea to drop something heavy, sharp or heavy and sharp from a hundred feet up a rig or even thirty feet for that matter. One time i was working aloft on a maxi rig trying to change a metal sheave in the masthead box. 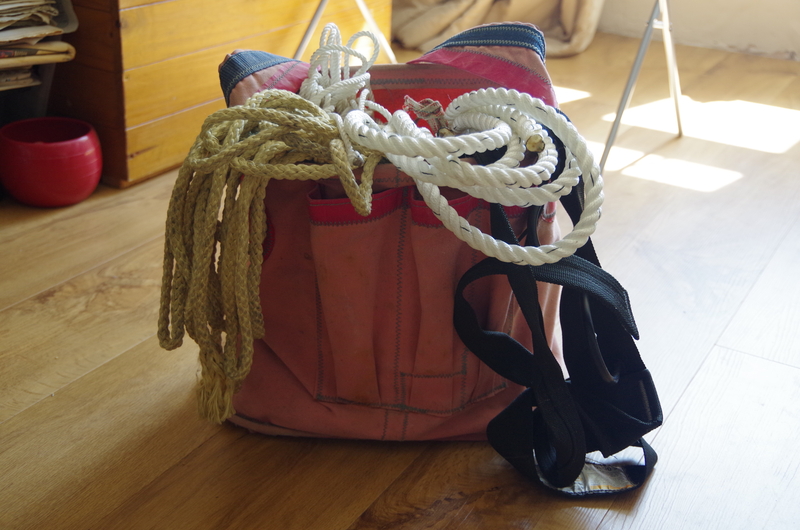 I had all my tools either tied to me or in the rigging bag, that’s it’s original purpose, and even had a tie passed around the sheave before i eased it out. Unfortunately when i started to ease the axle out i suddenly had more things to handle than hands to deal with them and a sudden lurch of the boat sent the metal sheave hurtling down to the deck. Now, i insist that nobody stands underneath where i am working and that sheave went through about 6mm of GRP before burying in the balsa sandwich under the glass…..what it would have done to somebody’s head i shudder to think ! The design of the rigging bag is that of a broad based and narrower necked bucket that is tall enough so that common tools can’t easily drop out and has 3 side pockets intended to separate the most common tools i use aloft : usually a shifty spanner, a pair of molegrips and a big flat bladed screwdriver. What i try to do though is attach each of those tools directly to me or the bag. one of the great things about a climbing harness as a mast climbing rig is the feature that a climber calls a ‘gear rack’ which are the side loops intended to carry the climbers ‘protection’ which is placed by the lead climber. My current climbing harness is actually a light and simple alpine climbers one rather than a full-on crag harness. It’s only purpose is to prevent a fall in the event of coming ‘off the plank’. Many of my boat (deck) tools have lanyards permanently attached so that i can slip the lanyard over my wrist while i am working, then if i drop the tool i don’t lose it . Annoying recently i dropped my only 8mm ring spanner into the engine bilge on Inanda and couldn’t retrieve it because the gap next to the engine is too small for a hand but plenty big enough for a small spanner. Even a temporary lanyard would have prevented that even though it would have made the task marginally more awkard. Aloft, not dropping tools is critical. Some tools are easy to attach a lanyard to as they usefully have a hole at the base, some, for example screwdrivers and hammers are more difficult although i found a useful brand of screwdrivers recently that come with a hole in the handle. A useful knot or hitch for securing awkward tools is the kleimheist knot which is a variant on the common prussik knot and what i usually do is tape over the knot as well. The kleimheist and prussik knots are both common climbing knots and usually tied in cord ‘slings’ which i normally use as my tool lanyards. The micro-slings themselves i usually make from 2 or 3mm dyneema which i keep in stock for lashing small blocks to fittings as i did with WABI”’ new deck layout. Often when i am working i will clip the tool into the harness attachment point which is at chest height. Shifting spanners on a carabiner, i don’t often use both aloft. While i am here i should mention my approach to knives aloft. While my standard rigging knife is always set up with a permanent lanyard i rarely carry that knife aloft. My current practice is either to carry a neck-worn knife which is a common practice in bushcraft or have a smaller sheath knife attached to my buoyancy aid. My buoyancy aid, which is use in preference to a lifejacket is also permanently set up with a knife in a sheath that is hard-attached to it. The normal way of carrying a knife aloft when working in a traditional bosun’s chair is to wear it ‘sailing-ship’ style ie at the back of the belt where it’s accessible with either hand. That works well in some settings but not when i spend a lot of time sitting which tends to be a lot of the time on small sailing boats. In the days when i sailed big boats i spent much more time standing, at the wheel for example, or just watchkeeping…..it does tend to alarm Mr Plod though !